Data used in this post come from the following sources: 1.) Industry Week and the 2.) International Trade Administration. Let’s take a look at what each state contributes to the total $2.3 trillion dollar figure. TEXAS: Texas merchandise exports increased 5.7%, growing from $264.7 billion to $279.7 billion. Key merchandise export categories include: petroleum products; computer and electronic products; chemicals; machinery manufactures; and transportation equipment. CALIFORNIA: California merchandise exports increased 3.9%, growing from $161.9 billion to $168.1 billion. Key merchandise export categories include: computer and electronic products; transportation equipment; machinery manufactures; miscellaneous manufactures; and agricultural products. WASHINGTON: Washington merchandise exports increased 8.4%, growing from $75.6 billion to $81.9 billion. Key merchandise export categories include: transportation equipment; agricultural products; petroleum products; computer and electronic products; and food and kindred products. LOUISIANA: Louisiana merchandise exports increased 0.3%, growing from $62.9 billion to $63.1 billion. Key merchandise export categories include: petroleum products; agricultural products; chemicals; food and kindred products; and machinery manufactures. MICHIGAN: Michigan merchandise exports increased 2.6% growing from $57.0 billion to $58.5 billion. Key merchandise export categories include: transportation equipment; machinery manufactures; chemicals; computer and electronic products; and primary metal manufactures. 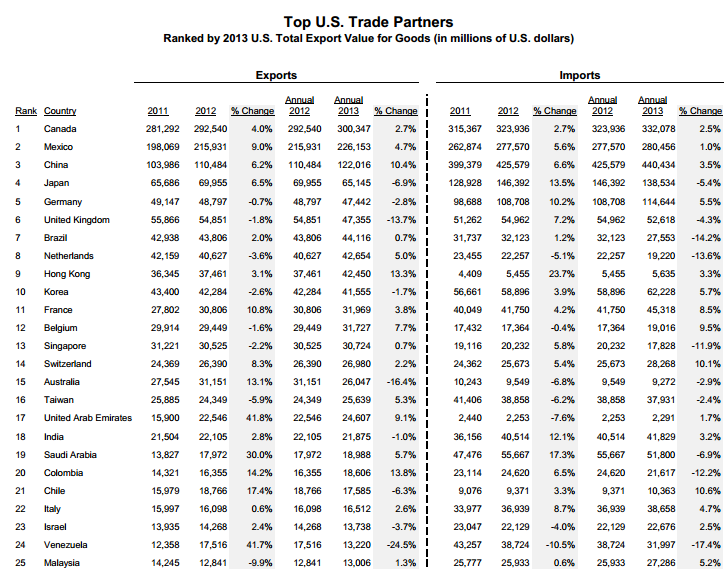 OHIO: Ohio merchandise exports increased 3.9%, growing from $48.6 billion to $50.5 billion. Key merchandise export categories include: transportation equipment; machinery manufactures; chemicals; computer and electronic products; and fabricated metal products. GEORGIA: Georgia merchandise exports increased 4.2%, growing from $36.1 billion to $37.6 billion. Key merchandise export categories include: transportation equipment; machinery manufactures; chemicals; paper; and food and kindred products. TENNESSEE: Tennessee merchandise exports increased 4%, growing from $31.1 billion to $32.4 billion. Key merchandise export categories include: transportation equipment; chemicals; computer and electronic products; miscellaneous manufactures; and machinery manufactures. NORTH CAROLINA: North Carolina merchandise exports increased 1.6%, growing from $28.8 billion to $29.3 billion. Key merchandise export categories include: chemicals; machinery manufactures; transportation equipment; computer and electronic products; and textiles. SOUTH CAROLINA: South Carolina merchandise exports increased 4%, growing from $25.1 billion to $26.1 billion. Key merchandise export categories include: transportation equipment; machinery manufactures; chemicals; plastics; and paper. Every $1.00 billion creates 5,000 jobs in our country with ninety-five percent (95%) of the potential consumers lying outside our borders. I personally believe the work ethic demonstrated on a daily basis by men and women in our country is the best in the world. It always amazes me that many people never take ALL of the vacation time they have available, consequently losing a considerable number of days that cannot be “rolled over” into the next year. These days are simply lost, which is absolutely unique to our country. Many Western European countries take their “summer sport” and “winter sport” no matter what. I have dealt with companies in Germany, Italy, Austria, Holland and others that literally close down during August of each year. Everyone dealing with them knows that and plans for that certainty. We could see a huge improvement in unemployment IF just the FED would agree to “buy American”. Can you imagine the boost in employment? It would be astounding and I can tell you from experience, the quality of purchases would improve tremendously. I would love to get your thoughts on this topic. Please drop me an e-mail and let me know what you think. The following information was taken from an on-line publication called Reporters Without Borders and Industry Week. Our founding fathers exhibited remarkable vision when structuring the Government of the United States. Three branches; Executive, Legislative and Judicial—separate but equal. Separate is easy because each branch has its own duties and responsibilities as spelled out by the Constitution. The equal is more difficult. Equal depends upon a free-flow of information between each branch, something in fairly short supply these days. For this reason, we depend upon the press. A free press, unobstructed relative to telling the entire story—supposedly the real truth. Admittedly our “free” press is definitely biased. You have media outlets leaning left; i.e. MSNBC, NBC, CNN, NPR. etc., and those leaning right; Fox News, Wall Street Journal, etc. We get to pick and choose and in the end, believe whomever we will. The issue is access to a story. The access provided by the “Fed” is absolutely critical to ensure basic freedoms we now enjoy. This access, by the way, includes stories and notifications involving STEM (science, technology, engineering and math) subjects. Can you imagine our Federal government withholding a truly groundbreaking announcement on a drug proven to be life-saving? That would be a definite travesty of justice. The questions consider six general criteria. 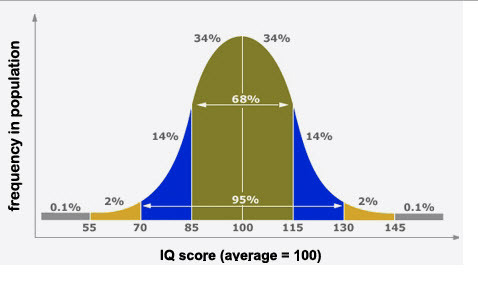 Using a system of weighting for each possible response, countries are given a score of between 0 and 100 for each of the six overall criteria. These scores are then used as indicators in calculating each country’s final score. o Media independence—Measures the degree to which the media are able to function independently of the authorities. o Transparency–Measures the transparency of the institutions and procedures that affect the production of news and information. o Infrastructure–Measures the quality of the infrastructure that supports the production of news and information. Given below is a map showing the various rankings. Please note the color codes in the center. The United States is forth-sixth (46th) on the list. There are definite reasons for our ranking and the fall in that ranking relative to 2009. In the United States, 9/11 spawned a major conflict between the imperatives of national security and the principles of the constitution’s First Amendment. This amendment enshrines every person’s right to inform and be informed. But the heritage of the 1776 constitution was shaken to its foundations during George W. Bush’s two terms as president by the way journalists were harassed and even imprisoned for refusing to reveal their sources or surrender their files to federal judicial officials. There has been little improvement in practice under Barack Obama. Rather than pursuing journalists, the emphasis has been on going after their sources, but often using the journalist to identify them. No fewer than eight individuals have been charged under the Espionage Act since Obama became president, compared with three during Bush’s two terms. While 2012 was in part the year of WikiLeaks founder Julian Assange received his fifteen minutes of fame, 2013 will be remembered for the National Security Agency (NSA) computer specialist Edward Snowden, who exposed the mass surveillance methods developed by the US intelligence agencies. The whistleblower is the enemy. Hence the 35-year jail term imposed on Private Chelsea Bradley Manning for being the WikiLeaks source. This is an extremely long sentence but small in comparison with the 105-year sentence requested for freelance journalist Barrett Brown in a hacking case. Amid an all-out hunt for leaks and sources, 2013 will also be the year of the Associated Press scandal, which came to light when the Department of Justice acknowledged that it had seized the news agency’s phone records. 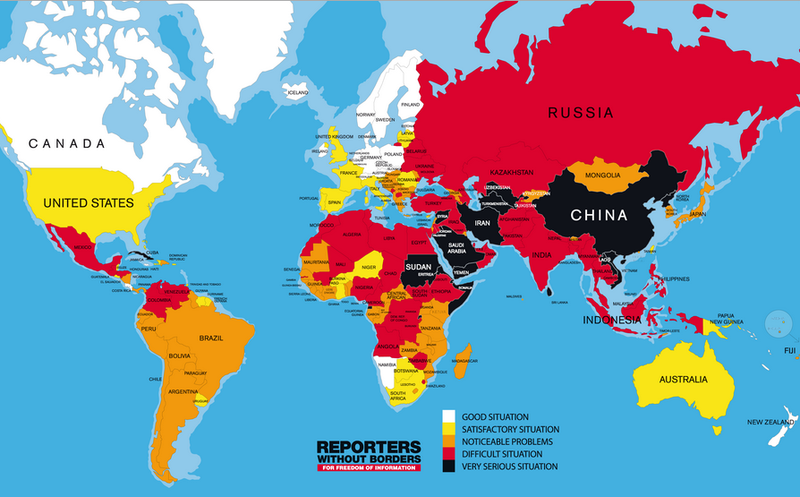 To calibrate our position, let’s take a look at other countries to see where they stand relative to freedom of the press. Please keep in mind that only 180 countries participated in the survey. There is no doubt that governments control their people by controlling the press and yet, it is absolutely mandatory that we have unfettered freedom of the press if we are to continue as a viable republic. I definitely await your comments on this one. “Of all the virtues we can learn, no trait is more useful, more essential for survival and more likely to improve the quality of life than the ability to transform adversity into an enjoyable challenge”. Those words were spoken by Mihalyi Csikszentmihaly. Csikszentmihalyi is noted for his work in the study of happiness and creativity, but is best known as the architect of the notion of flow and for his years of research and writing on the topic. He is the author of many books and over 120 articles or book chapters. Martin Seligman, former president of the American Psychological Association, described Csikszentmihalyi as the world’s leading researcher on positive psychology. Csikszentmihalyi once said: “Repression is not the way to virtue. When people restrain themselves out of fear, their lives are by necessity diminished. Only through freely chosen discipline can life be enjoyed and still kept within the bounds of reason.” His works are influential and are widely cited. Csikszentmihalyi received his B.A. in 1960 and his PhD in 1965, both from the University of Chicago. In his seminal work, “Flow: The Psychology of Optimal Experience”, Csíkszentmihályi outlines his theory that people are happiest when they are in a state of flow— a state of concentration or complete absorption with the activity at hand and the situation. It is a state in which people are so involved in an activity that nothing else seems to matter. The idea of flow is identical to the feeling of being in the zone or in the groove. The flow state is an optimal state of intrinsic motivation, where the person is fully immersed in what he is doing. This is a feeling everyone has at times, characterized by a feeling of great absorption, engagement, fulfillment, and skill—and during which temporal concerns (time, food, ego-self, etc.) are typically ignored. Personally, I really don’t think this is a theory but an actual fact. Have you ever been so absorbed in a project or endeavor you lost track of time? I think we all have. I can remember one incident where I continued to work long after “the bell rang”. Friday evening, eight o’clock and I was still working. My wife called me to ask “are you coming home tonight”? It was a difficult project needing complete concentration on my part and I simply lost track of time. Dr. Csikszentmihalyi indicates this “zoned-out” feeling is one means to survival and can have a great influence on improving our quality of life. It is one way to “turn lemons into lemonade”. According to psychologists dealing with cognitive issues, there is a wide array of responses to adversity, but the one that can be most debilitating is catastrophizing. People catastrophize when they turn everyday inconveniences into major setbacks and those setbacks into disasters. Catastrophizing often involves destructive rumination over bad events. These ruminations represent the most damaging connections you can make. Catastrophizing is a definite, remarkable barrier to flow. There is no “zone” if you are in a panic or bent double with worry or doubt. One extraordinary book discussing adversity is “Adversity Quotient” by Dr. Paul G. Stoltz. I can definitely recommend this book to you. It’s a marvelous “read” where questions are asked and results given to determine your AQ. In your brain, Catastrophizing is like any other response to adversity. You are merely following a subconscious neurological groove, a pathway made more efficient and discernible from repeated use. To halt this pattern, you must interrupt or stop it dead in its path. You may create the neurological interrupt by using any of the following eight (8) techniques. Slam you palm on a very hard surface, shout “stop”. This sounds a little sophomoric but it has been proven to work. The very act trains your system to interrupt the “gloom and doom” scenario and get back to reality. Focus intently on an unrelated object. A bit quieter and less dramatic, thus better in public situations. Place a rubber band on your wrist and snap out of it. This is a very physical reaction producing a very slight pain but that just might snap you back into reality. Distract yourself with an unrelated activity. Alter your state with exercise. Of course, this is somewhat impractical in some (maybe most) situations. You can’t drop and start doing pushups when your mind wonders to the adversity at hand. Reframers are devices to put the adversity into perspective. Your focus becomes intense and inward. Refocus on your purpose. “Why am I doing this?” This reminds you of the reason you were originally involved. It can provide the “big picture” and allows you to focus. Why did you choose this job, this project, this company, this location, etc. Get small. Getting small involves consciously putting yourself in a situation where you are dwarfed by what surrounds you. Help someone else. Without a doubt, one of the most powerful tools to manage adversity is putting your problems into perspective by helping someone else with bigger problems than your own. I certainly hope you enjoyed this post. It’s different than what I normally write about but fascinating at any rate. The U.S. House of Representatives passed H.R. 2642, the Federal Agriculture Reform and Risk Management (FARRM) Act of 2013, on July 11, 2013, by a vote of 216-208. In looking at HR 2642, you will find it replete with entitlements representing pay-offs for votes given and corporate welfare. It is highly unlikely that taxpayers will reap any so-called “savings” from the almost $1 trillion spending bill. H.R. 2642 marks a 49 percent increase in cost over its 2008 predecessor and is packed with new crop insurance subsidy programs intended to lock in returns on commodities at record-high prices. These alone have the potential to cost taxpayers billions on top of the bill’s baseline. For example, corn prices have dropped nearly one half from their record highs in 2011 and 2012 when the farm bill was first being written. $190.20 billion dollars (approximately) is spent each year on medical issues resulting from obesity-related illnesses. 21% of annual spending for medical purposes is obesity-related. 37% of adults are pre-diabetic. In the years 1971 through 1974, the average number of calories consumes on a daily basis was 1,996. From 2005 through 2008, that number was 2,234. On any one given day, 30 to 40 % of children and adolescence eat fast food. 20% of the weight gain between 1977 and 2007 is due to sugar-sweetened carbonated beverages. We are actually killing ourselves slowly but surely on both fronts. We just can’t quit spending and we just can’t quit eating. Now, in some ways this is like the pot calling the kettle black. I exercise six (6) days per week to keep this boyish figure. It ain’t easy but at the tender age of seventy-one, I know it can be accomplished. I welcome your comments. That effort continues by companies such as BOEING and governmental agencies such as NASA. We also must factor into the “mix” educational institutions. All three contribute greatly in the search for improvements relative to reducing the use of precious, non-renewable fossil fuels. The following is one such effort. Boeing designed the concept as part of SUGAR (Subsonic Ultra-Green Aircraft Research) to help conceive of airplane technologies and designs needed 20 years from now to meet projected fuel efficiency and other “green” aviation requirements. 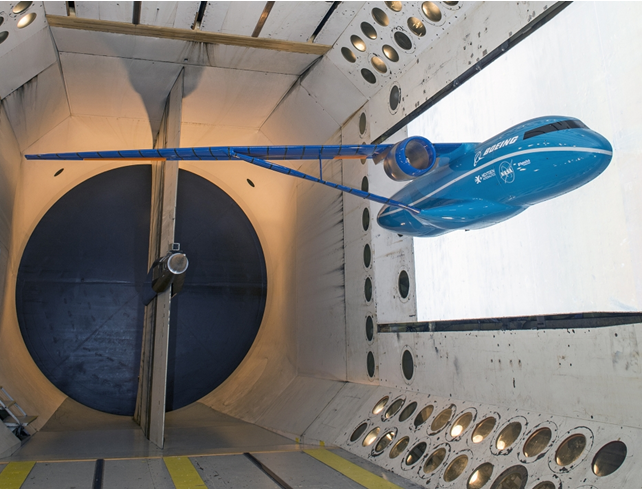 According to Boeing engineers the wind tunnel tests will help validate the analysis done during the SUGAR study, which predicts that the truss-braced wing would improve fuel consumption by 5 to 10 percent over advanced conventional wings. Boeing’s SUGAR work, as well as that of other teams studying advanced future aircraft concepts, is funded through NASA’s Fundamental Aeronautics Program’s Fixed Wing Project. I will certainly keep you posted as to further developments in the “GREEN AVIATION” world. It’s a fascinating technology.